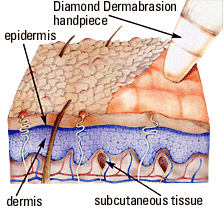 Microdermabrasion treatment provides effective exfoliation and rejuvenation of the skin. This technology helps diminish fine lines and wrinkles, reduces dark spots, reduces the appearance of superficial skin damage from aging and the sun, reduces enlarged pores, and increases circulation for healthier skin, with no interruption of your daily activities. It requires no recuperation time. Skin resurfacing is achieved using a highly controlled spray of fine crystals, (one hundred microns in size), under pressure and vacuum. These crystals erase the imperfections and sun damage, without damaging the skin’s integrity. The result: a smoother, more youthful appearance. The skin-resurfacing procedure acts to remove the outer layer of skin in a highly controlled manner. Because of its preciseness, it is practically painless. This process, when repeated multiple times, allows the younger, softer skin to move to the surface, promoting discernible changes in texture, color, and appearance.